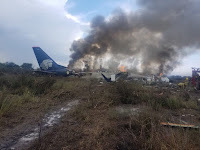 Looking at the news reports and photos, it is remarkable that anyone got out of the wreckage of the Aeromexico Connect Embraer 190 aircraft alive, yet astonishingly, all 103 people on board survived the crash. 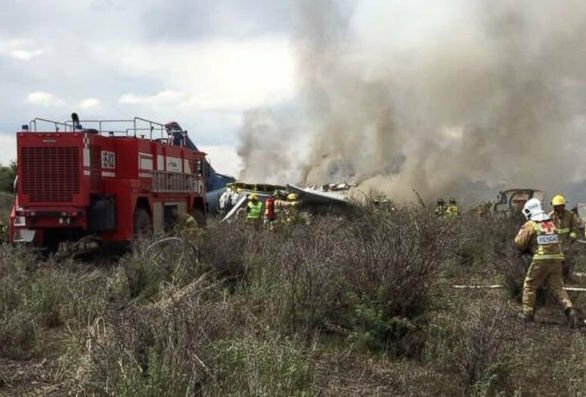 The aircraft, registration XA-GAL, had just taken off from Guadalupe Victoria International / Durango International Airport operating flight AM2431 to Mexico City when the crash happened. 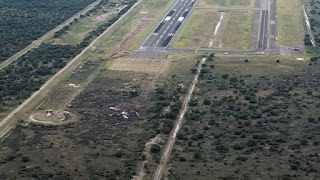 According to state Governor José Rosas Aispuro the aircraft was hit by a gust of wind, which caused the sudden descent. Its left wing then came in contact with the ground and both engines came off. The Governor also said the cabin crew were able to deploy the evacuation slides shortly after the crash when the aircraft came to a halt, which allowed those still on board to leave the plane safely before the flames spread and many of the passengers were able to walk and run from the aircraft. It is understood that the pilot is one of two people that were seriously injured in the crash and is said to have had a spinal operation. A young girl was the other seriously injured person, sustaining burns. Ninety-seven other people were taken to hospital, yet the vast majority had only "very light" injuries, officials have said. Jacqueline Flores a passenger on the E190 has been telling local media of her ordeal, "When we were already aloft, up high, it felt like the plane was going to level out but just then it plunged to the ground," she said. "I think we fell back on the runway because it was a hard surface, then we skidded on the ground until it stopped,"
There are reports of heavy rain and possible hail at the time of the accident and some local media are reporting that the pilot had tried to abort the take-off, but was already beyond the point where that becomes impossible, although it should be stressed that these are unconfirmed opinions and supposition. Rómulo Campuzano, a local politician who was also on the flight explained he felt "very lucky because I was able to get out by the main door" as he described how the door had been torn off and when the aircraft came to a rest was "acting as a ramp". He added, "I walked away from the plane, turning around to see if the other passengers were getting out, too. It started raining very hard and I think that helped put out the flames." As is the case with most air accidents, there are likely to be a multitude of reasons why this Embraer E190 came down just after takeoff. The weather will undoubtedly be one, wind shear, downdrafts or even a microburst may be other contributory factors. Mechanical failure cannot be ruled out at this early stage and also in contention will be the flight crews decision to attempt the take off in the first place given the weather conditions. The investigation will also have to look at the weight of the fully laden aircraft, to ensure it was being operated in accordance with its safe operational parameters. Yet, no matter what the investigation finds, one thing is for sure, those 103 people were incredibly lucky to escape such a crash with their lives. This is a very difficult day for the passengers, pilots, flight attendants, families and loved ones of all those affected by this accident, as well as for the Aeromexico family and Mexican society. During a press conference, the CEO of Aeromexico Andres Conesa stated: "Our heart is with those affected and their families. We are deeply sad and moved by this incident, and we would like to reiterate, first of all, that the Grupo Aeromexico family extends its support, thoughts and prayers to those affected and their families. We are doing everything in our power to assist them." On the aircraft were 88 adult passengers, nine minors, two infants and four members of crew, two pilots and two flight attendants. So far, no human losses are reported thanks to the prompt action of the crew and passengers. For Aeromexico the safety of its customers is the main priority and therefore the more than 14,000 Aeromexico employees are committed to the well-being of passengers and their families. The aircraft involved yesterday was an Embraer 190 with registration XA-GAL, manufactured in 2008 and operated by Aeromexico since 2014. Attention for passengers and crew in nearby medical units. Aeromexico has made free transportation available to relatives of affected passengers to Durango. To this end, a telephone helpline has been established at +52 (55) 51 33 40 59 in Mexico and 1 866 205 4084 from abroad. Aeromexico also informed that it is closely collaborating with the relevant authorities, particularly with the Director General of Civil Aviation (DGAC), to establish the causes of this accident. On behalf of the company, Andres Conesa especially thanked the crew for their professional actions and the Federal and State authorities, who from the first minute have supported the rescue and assistance operations. Likewise, he also thanked the employees for their professionalism and prompt response, as well as other airlines that have expressed their solidarity. Finally, the company reaffirmed that it is 100% focused on doing everything in its power for the well-being of passengers and their families.